Our mission is to expand gaming by creating the largest and fastest global B2B game platform for the digital distribution, commerce and social engagement of video games to any platform or device. Europa Universalis titles will be marked down to 75% off in an exclusive one-day promotion. 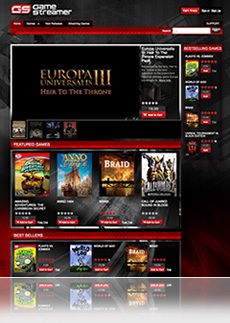 The French company has collaborated with Media Speed Tech to offer a discount on popular titles for one week. Berlin-based publisher distributes casual, RPG and shooter titles. We learn by doing. What better way to keep on top of the challenges our partners face than by running our own store? www.gamestreamer.com provides information to improve service for our partners in the White Label Program.